Satellite image of the Pollock Park trenches, taken 24/05/2018. Features are marked numerically and match the headings in this post. Google 2018. For the past three years, Northlight Heritage, in partnership with the University of Glasgow and Glasgow City Council, has built and maintained a series of reconstruction trenches in the grounds of Pollok Country Park. As the centenary comes to a close, so to do the trenches, with the final open day taking place Sunday 9th of December 2018 (For more information see here). This post is the first of a two part blog which will take a virtual tour of the trenches explaining their purpose and how they have developed over the past three years. The second part of this blog will be made available on the DiggingIn Website. Earlier this year in April we released a blog announcing that the student-led project Words of WW1 was looking for actors and film-makers to come together to film a series of cinematic recitals of poetry from the First World War. After a stunning premiere in the University of Glasgow’s Memorial Chapel on August 20th, the project has released one new poem each week, each one focusing a different aspect of the First World War. This blog post collects together the 10 videos created by the project into a single post. Each video has been given a brief introduction discussing the background to each poem and how this has been interpreted in the film. ‘Shipbuilding on the Home Front during the Great War, with special reference to Clydeside’. An event to mark the centenary of the end of the Great War. Sponsored by the Centre for Business History in Scotland. By Euan Loarridge, PhD Candidate, Department of History, University of Glasgow. Header of Army Form M.T.392 (The Pink Form) Application for a appointment to a temporary commission in the Army during WW1. WO_339/38350 TNA, London. Amongst the National Archives’ vast collection of documents relating to the First World War are boxes WO_339 and WO_374, which together constitute a series of files related to the service records of individual officers of the British Army who served in that conflict. 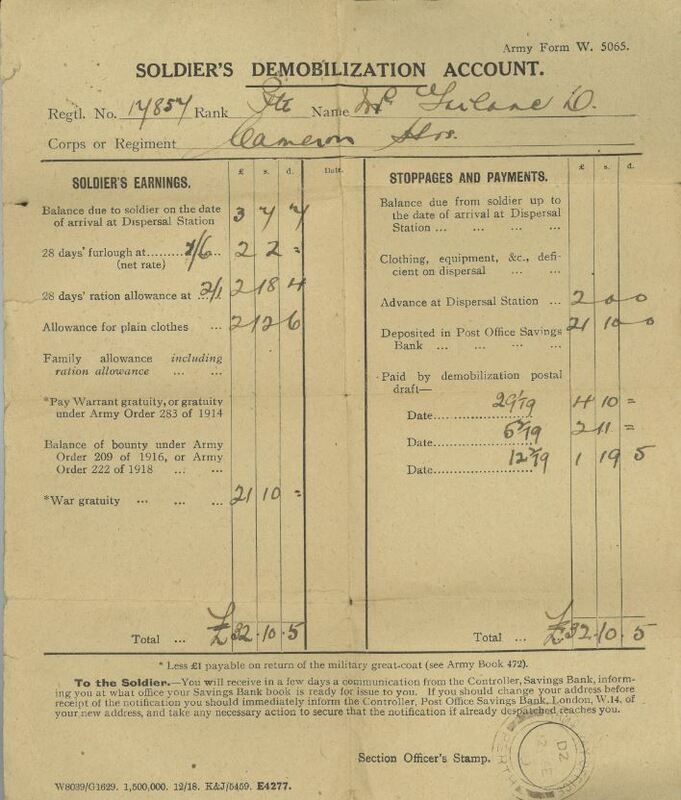 Unlike the service records for ordinary ranks, which are available to view and search online, digital copies of officers service records are not currently available and so can only be accessed in hard copy, in person, at the National Archives in London. Time: 19:30 – 21:15 approx. The University of Glasgow Choral Society & Chapel Choir are pleased to announce that the One Hundredth Anniversary of the 1918 Armistice will be commemorated by a special concert, held in the University’s Memorial Chapel on Saturday, November 10th. To mark this special occasion, a new choral piece has been commissioned from the young Glasgow composer, Tom Harrold, which will be premiered as part of the concert programme. The text of the piece, ‘A Glasgow Elegy’, has been written specially by the poet Grahame Davies and will be conducted by Katy Lavinia Cooper. Tickets: £10 (student concession £5 with ID) on door from 6.45pm subject to availability. and took the way you cannot take again. but bitter fruit you did not fear to eat. and found a greater light a darker way. DC179-2-1-4-12 Photograph of S/17857 Private (Later Lance Corporal) Daniel McFarlane, 7th Battalion Queens Own Cameron Highlanders, taken while on leave in Tain, Invernesshire in 1915. As an Information Management and Preservation MSc student I have been volunteering at the University of Glasgow Archives & Special Collections, working on a project enhancing existing catalogues. 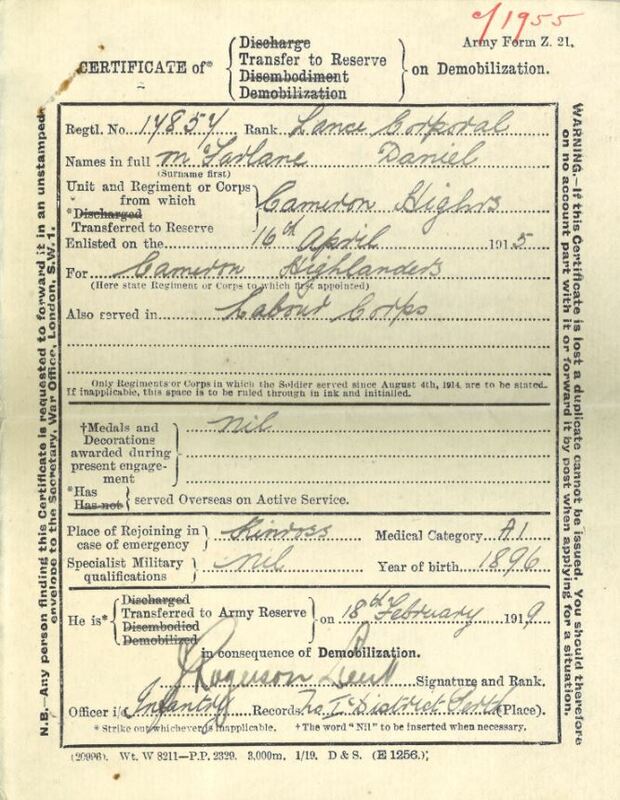 One of the collections is that of Daniel McFarlane, a medical graduate of the University who fought in the First World War having joined the 7th battalion of the Cameron Highlanders in April 1915. The collection includes an extensive archive of around two hundred letters written to his mother and three sisters throughout the war, which cover his experiences from initial training in Inverness and Tain, to fighting in the trenches in France, and finally ending his war in Belgium where he was demobilized in 1919. He does however mention that ‘So far we have had no prizes’  and jokes that he had better stop these or be accused a cheat. Writing to his mother in December 1918 following the Armistice of 11 November, Daniel’s thoughts have turned to future life beyond the war. He ask his mother to make enquiries on his behalf following reports he saw in the newspapers ‘that students were in the same position as men who had jobs awaiting them that is the men who would go first’  potentially after Christmas. 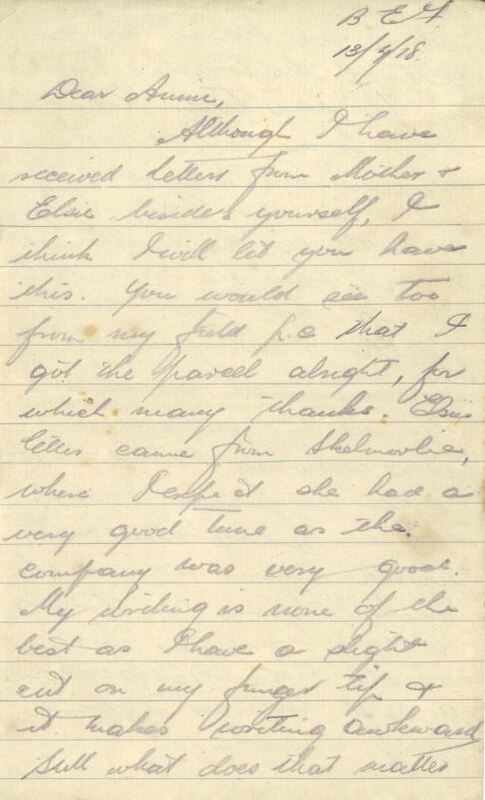 Daniel’s final letter from Belgium written on the 12th of January 1919, DC179/1/2/15/7. 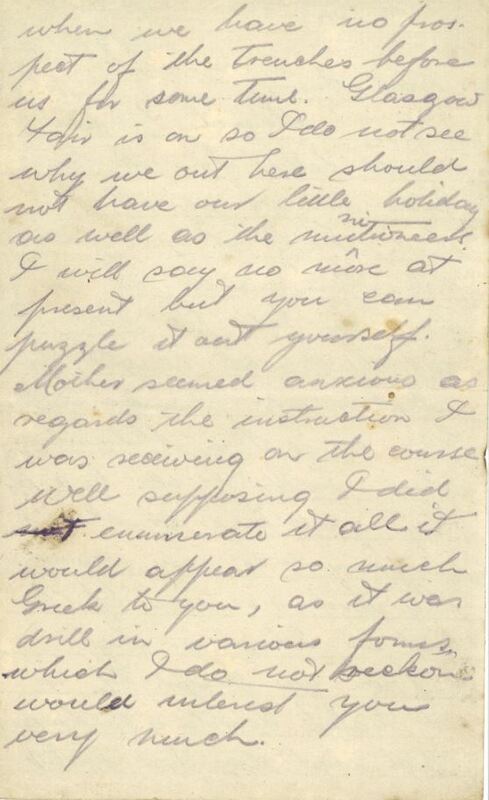 He ends this letter by asking her to ‘hunt out the “civvies”!’  That same year Daniel went on to study Medicine at Glasgow University, graduating in 1924. He continued to practice medicine as a GP until he retired in 1966. The First World War and the University of Glasgow: The Participation of Students and Staff by Nichola Jones. Hamish Ross’ new book on Archie Bowman was published by Pen & Sword in June 2018.